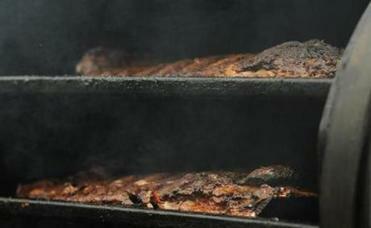 Sunshine and Brolin Winning serve ribs and other smoked meats Friday through the weekend at Smoky Bro’s. Ribs smoking at Smoky Bro’s BBQ. 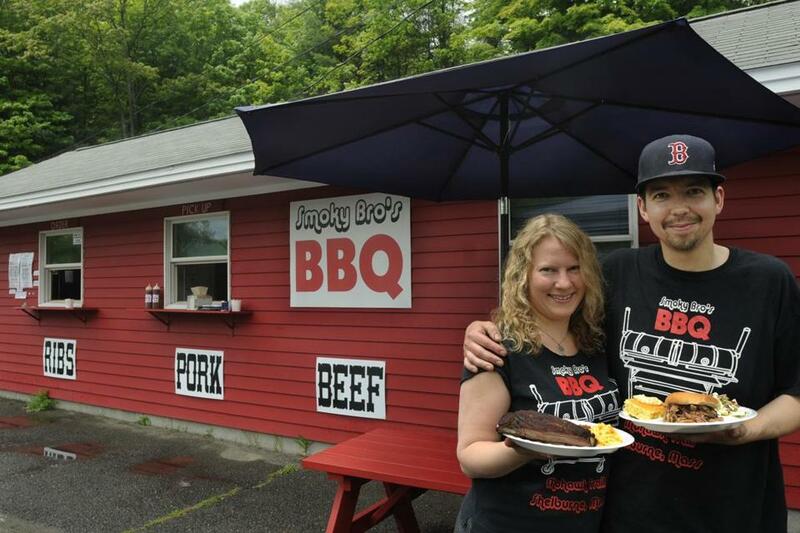 SHELBURNE — Smoky Bro’s BBQ lies along a stretch of the Mohawk Trail 4 miles east of the riverside village of Shelburne Falls. A roadside stand housed in a tractor-trailer-size red building wedged between a pine forest, a Native American-themed souvenir shop, and a mowed grassy field, the eatery comes up without warning — as does the lure of smoky meats. The “bro” behind the smoke is Brolin Winning, an Amherst native who returned to this region in 2009 after living in San Francisco’s Mission District for more than decade. Among other jobs, he earned a living in the Bay Area cooking and writing music reviews for iTunes, listen.com, and other online and print publications. In spite of his successes, he says, he craved the serenity of country life — fly fishing in particular — and Shelburne Falls, where he decided to live, was a place he had always loved. Soon after his return, Winning met the love of his life at a backyard barbecue, Sunshine Milkey, a name that captures her warmth. The pair married in 2010, and with just a pup tent, a small smoker, and a single picnic table, embarked on their first season of barbecuing May through October in Shelburne. The stand is open Friday through the weekend. In their free time, the couple camps, goes fishing, takes barbecue-themed vacations. Their work time is devoted to making their favorite foods for locals and passers-by on this scenic Massachusetts byway. If there is such a thing as a charmed life, this duo seems to have the inside track. Using a combination of applewood he harvests himself, along with hickory, oak, and maple (depending on the meat), Winning smokes about 150 pounds of spareribs a week in his 700 pound 6-by-6-foot black steel smoker. Reminiscent of a narrow gage steam engine, the smoker was fabricated four years ago by Holyoke artist and welder Julian Halpern, and can hold something in the neighborhood of two dozen racks of ribs. The meat menu is simple: ribs, barbecued beef, pulled pork, and chopped chicken. Order one meat and two sides for $12, two meats and two sides for $15, or three meats and three sides for $20. 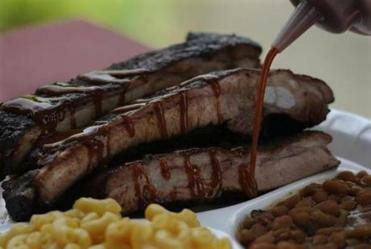 A sampling of ribs with Smoky Bro's sauce. Big meaty spareribs are prepared with a dry rub, refrigerated overnight, and smoked for three to four hours over apple and hickory — a kind of Massachusetts-meets-Memphis smoke cocktail. Sauces made with local apple-cider vinegar and maple syrup are on the side. For the brisket, served frequently as the house barbecued beef, Winning uses 12-pound packers — an untrimmed whole brisket that includes the fat-connected “point” and the leaner “flat” cut. They are coated in a 50-50 mix of kosher salt and cracked black pepper and smoked in various iterations for roughly nine hours before being sliced into juicy strips. The couple runs specials often. Coming soon will be lamb ribs inspired by Charlie Vergos’s Rendezvous Restaurant in Memphis. They will also offer a Hawaiian “plate lunch” (a nod to Winning’s Hawaiian heritage) featuring Kalua pig, plus beef and chicken teriyaki. On the sides end of things, there are straightforward versions of potato salad, spicy beans, coleslaw, and cornbread. Mac and cheese is memorable. Sunshine is in charge of the sides, and her pickled mustard greens will also be making a few intermittent appearances. The Winnings are now heading into their fourth season of road-side barbecuing. Life by the road and by the river, they agree, is pretty sweet. Shelley Kirkwood can be reached at shelley@monumental-i.com.